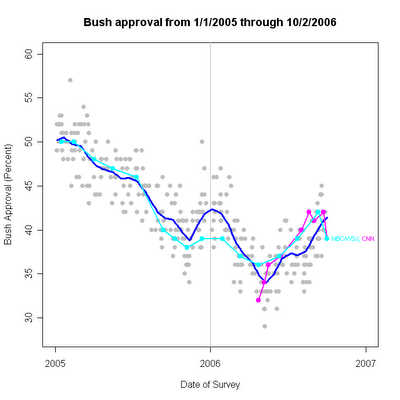 Bush Approval: Four polls, Trend at 36.2% (10/23) New! 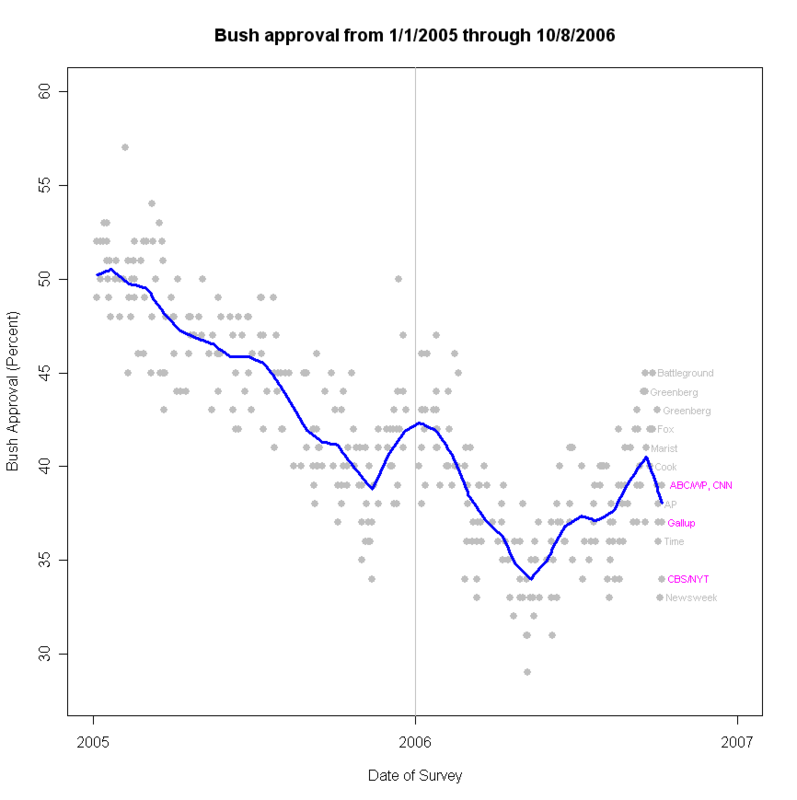 See the links to current and historical presidential approval graphs in the column to the right. statistical language, an open source, free, program for statistical computing, about which much more here. WI Gov: New polls, same story (8/18) Updated 8/21. Four more polls in today revise the trend estimate of approval of President Bush to 36.2%. CNN/ORC taken 10/20-22/06 has approval at 39%, disapproval at 58%. ABC/Washington Post, taken 10/19-22/06 has approval at 37%, disapproval at 60%. Newsweek, 10/19-20/06 found approval at 35%, disapproval at 57%. The new Cook/RT Strategies poll, taken 10/19-22/06, got approval at 37%, disapproval at 53%. The trend estimate is revised up from 35.8% as of polling through 10/15. The trend line (the blue line) remains down because the new data revises the rate of decline, rather than demonstrating (so far) a reversal of the decline. It typically takes 6-12 polls for a change of direction to be clearly revealed by the trend estimate. So far, the data do not hint that a reversal of direction has occurred. For example, the "sensitive" estimator shows a hint of flattening, but no upturn. 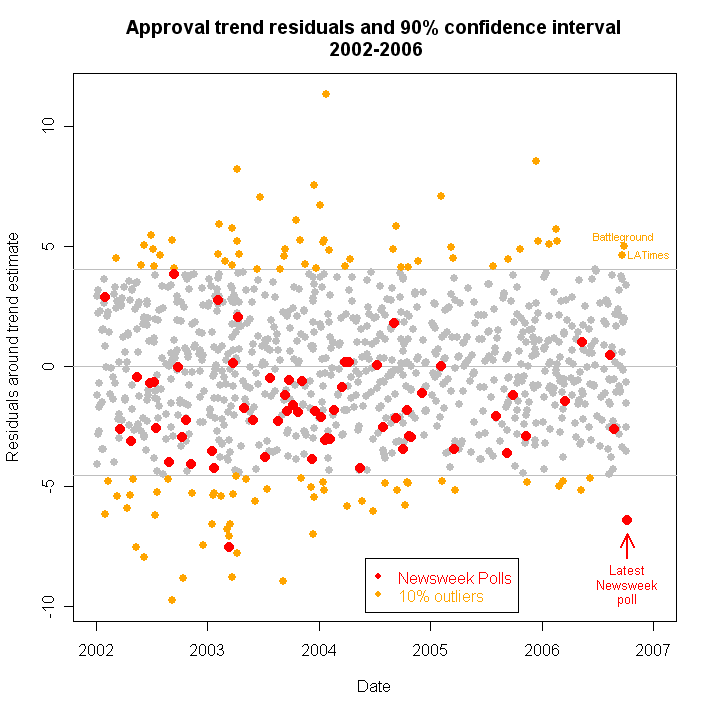 Since the sensitive estimator is easily fooled, it is too soon to say approval has stabilized. More data this week should help clarify this, however. 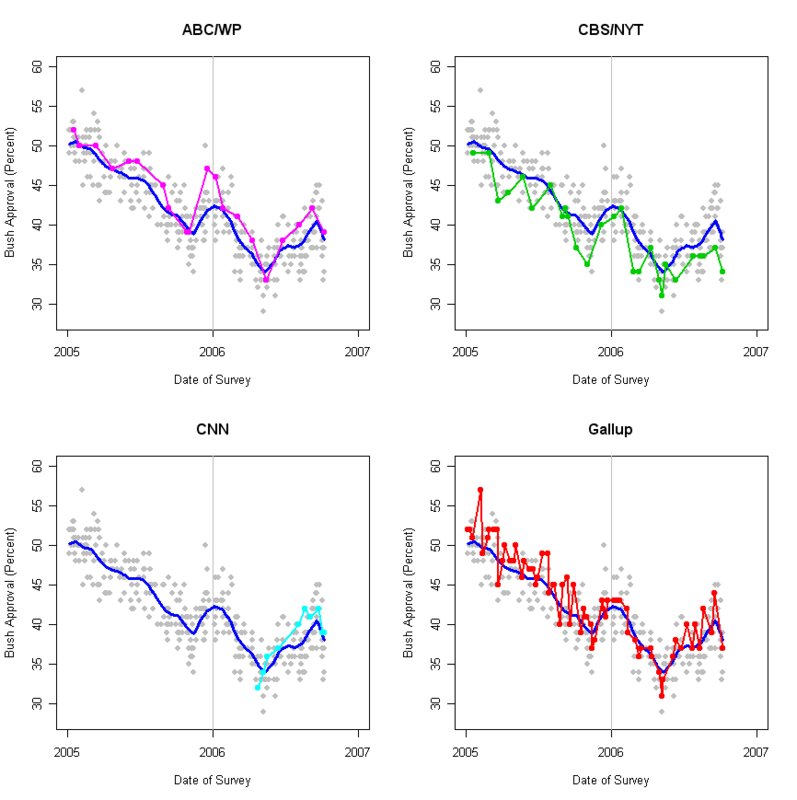 The figure below shows the four new polls. All results are reasonably close to the trend estimate. 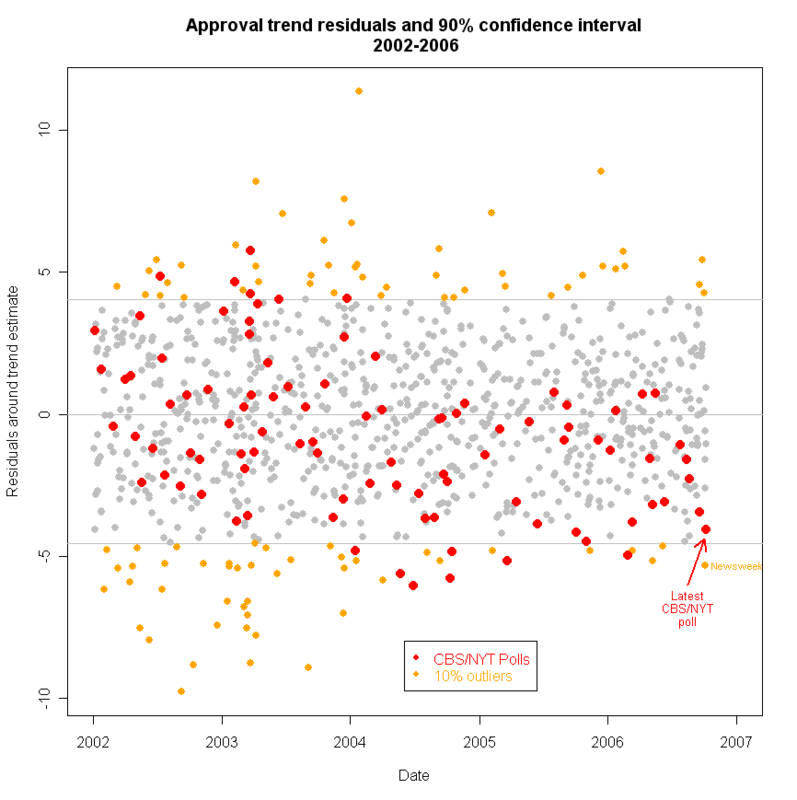 In response to a comment on the earlier item, I reran the analysis of Newsweek's previous poll, which I showed was an outlier, beyond the 90% confidence interval. Repeating that analysis with the new polls included does not change that result. For the time it was conducted, the previous Newsweek poll is still unusually low. Their new poll, in contrast, is well within the 90% CI, as are the vast majority of their polls. No time to write this up. Come back for that later. Bottom line: CNN at 36%, Gallup and Zogby at 37%. Trend estimate falls to 35.8% This is a stunning decline that doesn't yet seem to have reached bottom. Can the White House do anything to stop it? With the addition of these new polls, my trend estimate has continued to decline, now standing at 37.2%. Interestingly this trend estimate is virtually identical whether I use my usual "conservative" blue line estimator or the more sensitive (but easily fooled) estimator. 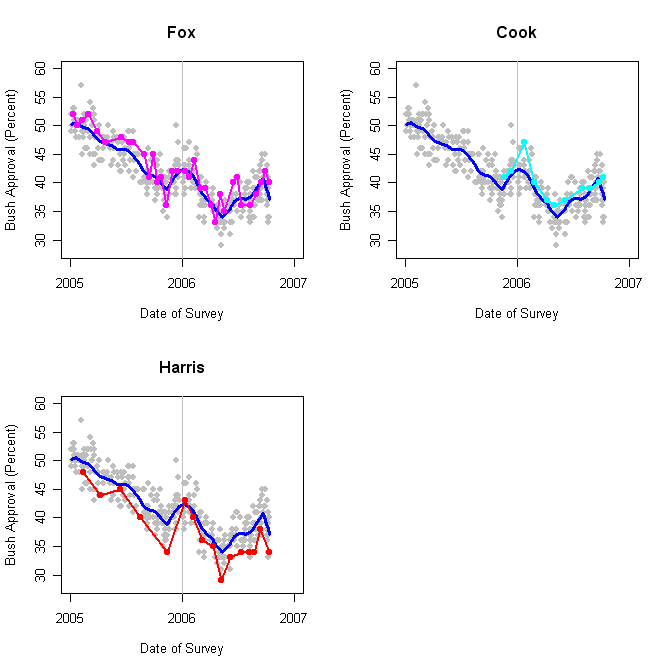 While two of these polls are still in the 40s, the Fox and Harris estimates represent declines from their previous result. Cook is a small rise from their previous reading. The current spread of results is consistent with the usual variability around the trend line of approximately +/-4.8%. An easier to see comparison of the individual polls with the overall trend is shown in the figure below. There are some clear house effects between the polls, but each tracks the trend reasonably well. 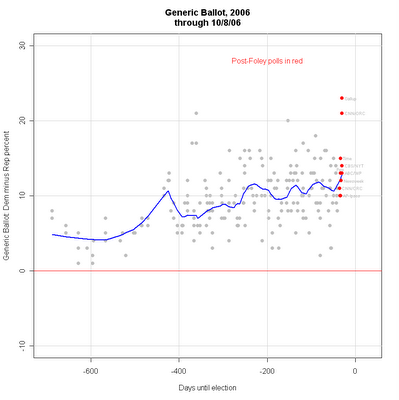 The post-Foley Folly polls find an upturn in the Democratic margin in the generic Congressional ballot. Prior to the Foley developments, Democrats held a 10.6 point lead in the polls. (This is the Dem percent minus the Rep percent.) That lead has now jumped to 12.8 points, the highest my trend estimate has reached in the 244 generic ballot polls taken this election cycle. This is all the more important because prior to the Foley Fiasco the trend had moved a bit down, then flattened (though still at or about 10.6, a very strong margin even then.) Whatever possible gains Republicans were beginning to make have now been wiped out. One important concern is that CNN and Gallup produce extraordinarily high values on the generic ballot in this poll. (Remember, these are now down independently-- CNN uses Opinion Research Corporation for it's polling, while Gallup now polls for USAToday only since the dissolution of the old CNN/USAToday/Gallup partnership.) These values of over 20 points are simply implausible given the rest of the data over the past two years, and the other data from the past two weeks. Could it be that my trend estimate is being unduly influenced by these two absurd results? No. If I exclude the latest CNN/ORC and Gallup/USAToday polls, the trend estimate is a Democratic advantage of +12.4 points, rather than the 12.8 points if these two are included. That small change in trend would still be the highest Democratic margin of the past two years, and when plotted the line without these polls is visually all but indistinguishable from the blue trend line in the figure. And so we are back to the key question: how much will this huge (compared to elections since 1994) Democratic lead translate into seats? Will we see movement in polls for individual House races move as well? Stay tuned. Four new polls find approval of President Bush has declined substantially since the end of September, following revelations of "overly friendly" email and IM messages from Rep. Mark Foley (R-FL) to pre-adult House pages. All these polls were completed before North Korea tested what appears to have been a nuclear weapon on October 9. The ABC/Washington Post poll, taken 10/5-8/06 finds approval at 39%, disapproval at 60%. CNN/ORC's poll from 10/6-8/06 also has approval at 39% with disapproval at 56%. The Gallup/USAToday poll (10/6-8/06) found approval at 37%, disapproval 59%. The CBS/New York Times poll (10/5-8/06) comes in low among this group, with approval at 34% and disapproval at 60%. With these new polls, the approval trend estimate has fallen sharply to 38.1%, a bit more than a 2 point drop since mid-September. Each of the polls shows a decline from the same poll's previous reading. These are too crowded to plot all four in one image, so here they are by poll. The CBS/NYT poll is quite low compared to the others, raising the possibility that it is another outlier, as was the Newsweek poll over the weekend. The graph below checks this, and finds that CBS/NYT is NOT an outlier, despite it's low reading of approval. With the new data, Newsweek remains an outlier, though less extreme than before the trend was revised by the four new polls. The conclusion is obvious. Approval has now given up most of the gains made in the August-September rally. 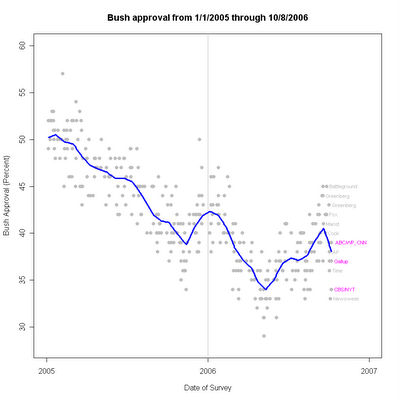 A new Newsweek poll finds approval of President Bush at 33%, a record low for the Newsweek organization, though not for other polls. The poll, taken 10/5-6/06 also found disapproval at 59%. As the graph above makes clear, however, the Newsweek poll is far below other recent polls and the current trend estimate. Before concluding that approval has "really" fallen to 33%, a good deal more data will have to confirm this extremely large drop. 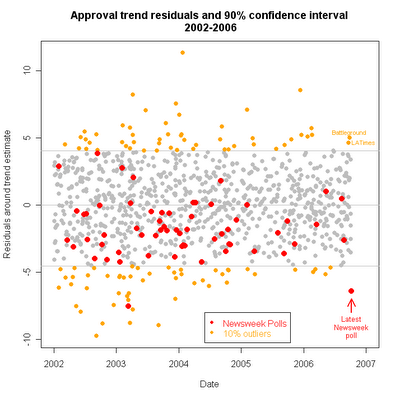 That is not to say that approval has not turned down. Indeed, after the last two weeks of unremitting bad news for the White House, it is hard to imagine how if could have failed to do so. The question is whether the Newsweek poll is a reasonable estimate of current opinion or if it is too far away from other results to be plausible. While a one point drop may seem small, this is a drop in the trend estimate, NOT the very noisy raw polls which move by much more from poll to poll but which also contain much more random variation. One point in 16 days is almost 2 points per month, which is quite a substantial rate of decline. For comparison, during the first five months of 2005, the President's approval declined by one point each 13.5 days, as estimated just before approval reversed and started back up on May 15. I hasten to add that we lack enough data to be at all confident as to what the current rate of decline actually is. One point per 16 days is merely the best guess given current data. It might be less or more and will certainly change as new data come in. So granted approval is now clearly going down, is the Newsweek poll telling us that the drop is of historic rapidity and that new polls will also show similarly dramatic drops, or is Newsweek's poll a statistical outlier-- getting the direction right but seriously overstating the magnitude of decline? 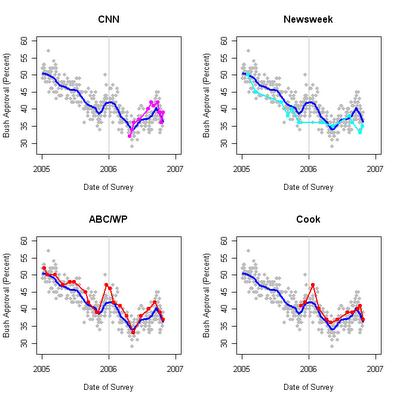 Based on all polling since 2002, the Newsweek result is clearly a statistical outlier. It is well below the 90% confidence interval in the figure below and is among the larger negative outliers of the past four years. The figure plots the residuals, the deviation from the trend estimate, for each poll taken since January 1, 2002. 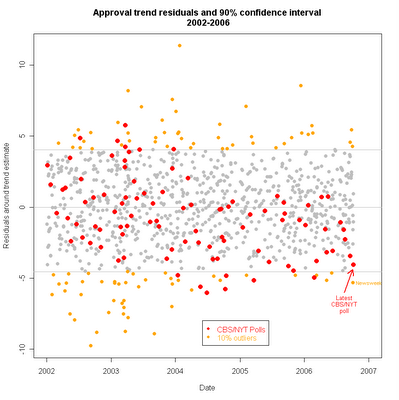 Orange points are polls that fall outside the 90% confidence interval, indicated by the low and high horizontal lines. The mean of all residuals is zero, the middle horizontal line. Newsweek polls are in red for easy identification. Newsweek has a good polling track record, producing only one previous outlier in 70 polls. Here "outlier" is any poll outside the 90% confidence interval. By definition, we expect 10% of cases to fall outside that range. 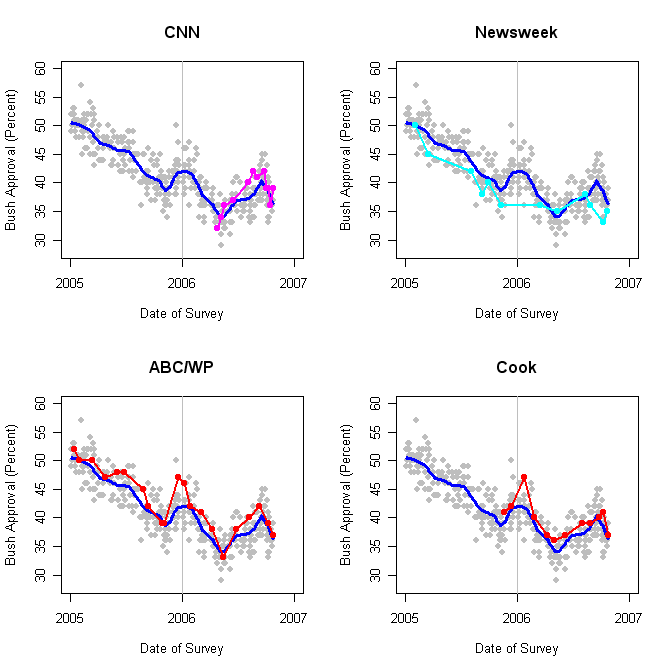 In fact, Newsweek has now produced two out of 71 polls since 2002 that are outside that 90% CI, a 2.8% rate. This latest poll, however, is clearly well beyond the lower limit of the interval. Two recent polls have also fallen outside, but above, the 90% CI. Both of these were completed prior to the revelations about Representative Foley's IM messages to House pages, though after the now estimated peak of approval on 9/20. Even if we focus on the four polls completed (at least partially) since the Foley Folly began, we see that all four are well below the trend estimate, but that the Newsweek poll is substantially below even these polls. The conclusion is that the Newsweek poll is implausibly low, given the other data we have seen so far. A possible (but statistically less likely) alternative is that approval is falling very rapidly so that the unusually low Newsweek result reflects a much sharper rate of decline than the 1% per 16 days that I currently estimate. 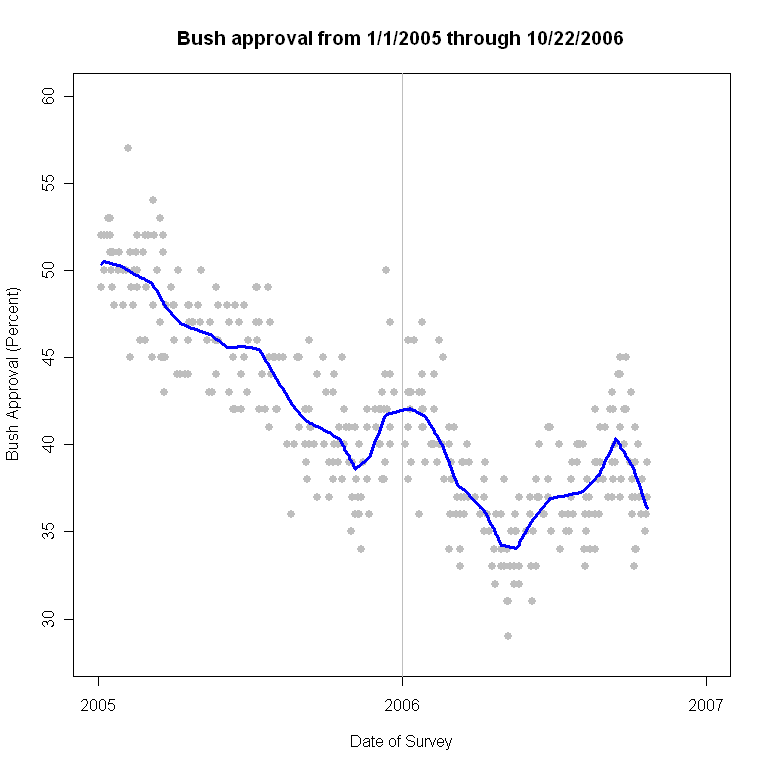 Such a rate of decline would be much higher than any yet seen in the Bush administration. I find this quite unlikely, but the data will answer this one way or another within a couple of weeks. For now, I'd bet the approval trend will fall another half point by the end of next week. If it falls much more than that, the Newsweek poll will look like a harbinger rather than a statistical fluke. 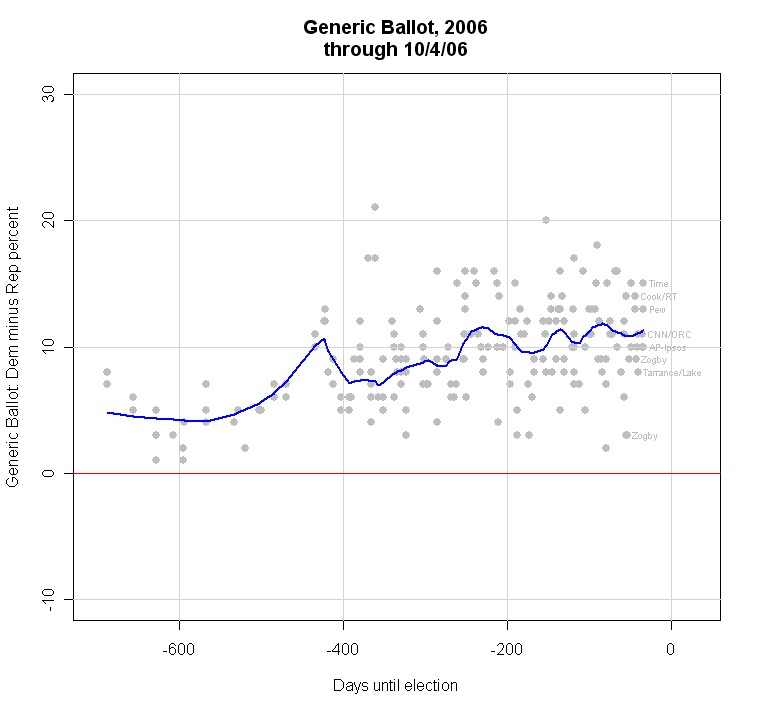 Generic Ballot: Decline ends, upturn?? 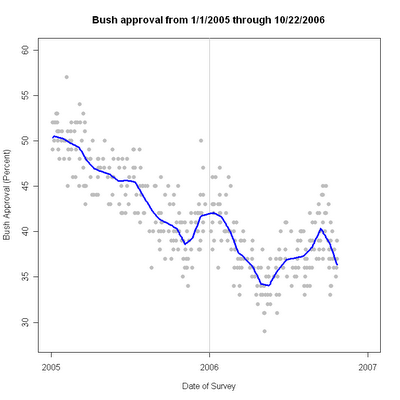 More post-NIE, post-Woodward, post-Foley polls are out, suggesting that approval of President Bush has stopped its recent rise and has begun to turn down. Polls from Time, AP and Greenberg find small declines since the previous poll. A Pew poll finds no change. A GWU-Battleground poll is useless for comparison because the previous poll is from February. The Time poll, taken 10/3-4/06 finds approval at 36%, disapproval at 57%. The AP poll from 10/2-4/06 has approval at 38%, disapproval at 59%. Pew's survey from 9/21-10/4/06 gets approval at 37%, disapproval at 53%. Greenberg/Democracy Corps was in the field 10/1-3/06 and has approval at 43%, disapproval at 53%. The GWU-Battleground poll is a bit stale, conducted 9/24-27/06. It found approval at 45% with disapproval at 53%. The net effect of these polls on my estimate of approval is a drop of 0.4 points from the peak on September 20 to a current estimate of 40.2%. That peak, however, is also a revised estimate. Without the newer polling, the approval trend had reached 42.0%. The revised estimate of the peak is only 40.6, so recent polling has called the previous high into question. More data will be needed before we can precisely estimate either the September high point or the precise date when the turn in support took place. While the AP, Pew and Time are generally below the trend estimate, their effect on the trend estimate is balanced by the typically high approval values from the Greenberg/Democracy Corps and GWU-Battleground polls. Likewise the "apples-to-apples" comparison of the plot for each polling organization increases the evidence that there is now a downturn in approval. Obviously we can't yet estimate how large or how sustained this turn may be. The Pew poll is interesting because it was in the field before the Foley news broke, having collected 777 cases, and then collected an additional 726 cases after the scandal became known. Comparisons of "before" and "after" show an identical 13 point Democratic lead in the generic ballot question, suggesting no immediate impact of the Foley news on vote intentions. Of course, as with so many Washington scandals, the story is as much about the aftermath of the revelations as the acts themselves. The "what did they know and when did they know it" drama now playing out around Speak Dennis Hastert seems likely to keep the story in the news for at least a few more days. One doesn't need polls to know this has been a bad week for the Republican party. 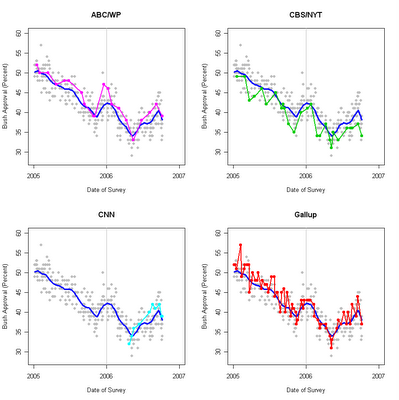 How much that affects polling, and how long such an effect endures, remains to be seen. For President Bush, the key question is whether he can resume his aggressive campaign efforts and can stay on his message of national security and terrorism. And if anyone is listening to his pitch at the moment. The challenge for Republicans is to change to subject. The challenge for Democrats is to take advantage of the October surprise effectively and to use Foley to advance a broader critique of the Republican congress. Stay tuned! Two new polls find approval of President Bush has fallen after a week of mostly bad news. The NBC/Wall Street Journal poll, taken 9/30-10/2/06 finds approval at 39% and disapproval at 56%. The CNN/ORC poll conducted 9/29-10/2/06 also puts approval at 39%, with disapproval at 59%. Both polls had registered approval at 42% in their previous readings. These polls come after a week that included debate over a new National Intelligence Estimate's conclusions on terrorism and Iraq, Bob Woodward's new book, and culminating with revelations of Rep. Mark Foley's email contacts with congressional pages. The polling was completed before the Washington Times called for House Speaker Dennis Hastert's resignation as speaker. The new data do not yet lead to a major change in my approval trend estimate. That currently stands at 41.4%. That's a revision down from 42.0%, but the trend has not yet turned clearly down. The trend line is deliberately conservative, and usually requires 6-12 polls before considering a change of direction reliable. 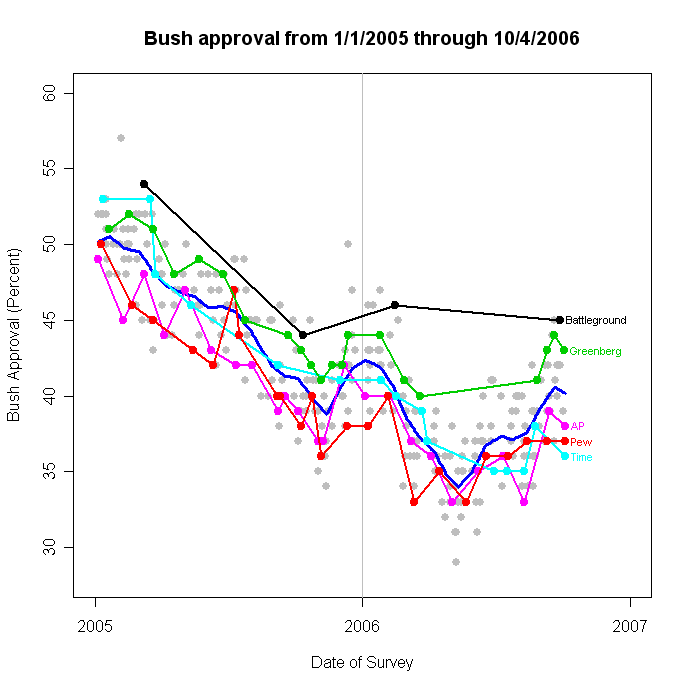 The three point drop in two polls, however, does suggest that President Bush may have suffered a significant reversal over the past week, after some 6 weeks of strong upward movement in approval. It is likely that more new polling will arrive soon, helping clarify how much of this move is a "blip" and how much a harbinger of a change in direction.